Well it isnt CBD, but it is a major investment in the CBD direction. 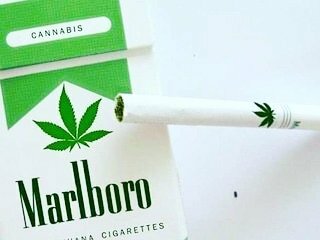 Marlboro has finally done it and made the mainstream move as a cigarette/tobacco company to make the shift from tobacco into marijuana. It been a long time coming and joked about for decades that one day youd be able to buy a pack of joints at a gas station. I guess with Marlboros investment into Cronos, you might want to keep an eye on the sky. Pigs must be flying. Within the next month, a revised farm bill is going to be moved forward. We see this as the reason Marlboro went ahead and committed to making this investment. The farm bill will open new doors to the cannabis industry. Making not only hemp more mainstream, it will be a push towards federal legalization of marijuana itself. This will also make the CBD market move. The farm bill will clear the air on hemp and CBD legality. As CBD is 50 state legal, it still has some hurdles to jump to beat laws in some municipalities in some states. Many places, even though the laws have been foggy, have allowed things to move forward, while others have said CBD is still illegal and barred retailers from selling it. One more piece of the puzzled filled in the direction of 50 state legalization.